The Golden Hill Community Garden was born out of the efforts of the Horfield and District Allotment Association and their plotholders. 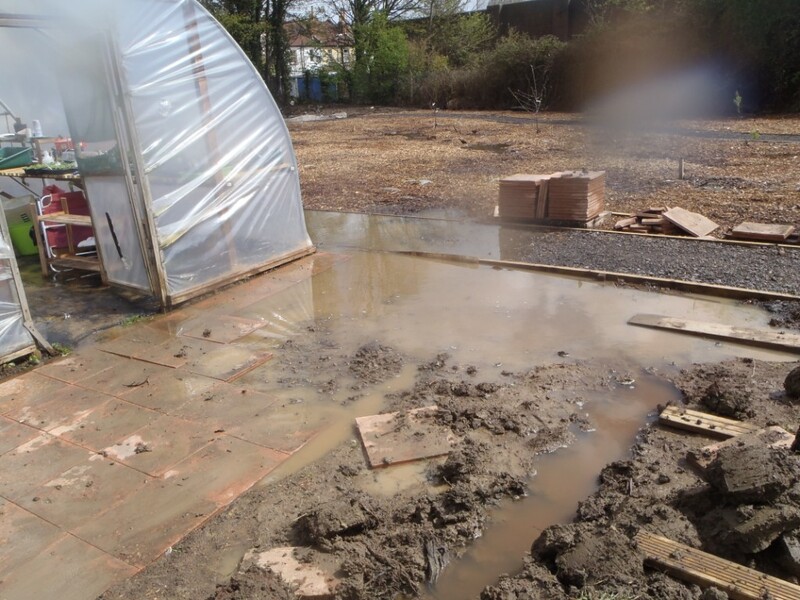 They wanted to create a community allotment which anyone could visit; a place accessible to people with physical and/or mental ill health or learning difficulties. An allotment for people who didn’t want, couldn’t get or couldn’t manage their own allotments, where people could be supported to learn and grow food together. 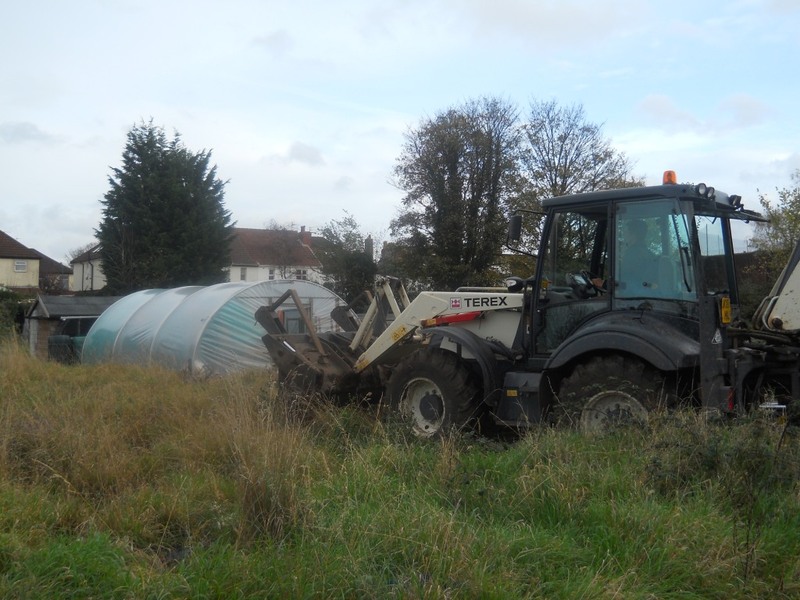 Four years of fundraising and paperwork later and the Big Lottery Fund and Green Capital gave the project the money we needed and then the physical work could begin. 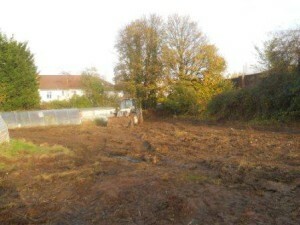 Most of the site hadn’t been used for years as it is prone to be very boggy. Every drop of rain that falls on Golden Hill seems to find its way down to us! Contractors came in November 2011 and cleared the brambles and weeds, leveled the ground and built the decking area, walk way, pagoda and some of the raised beds. Working through the winter it was muddy work, and the heavy machinery was exciting and terrifying in equal measure as brambles disappeared in an instant but our ground became churned up and compacted. Drainage is always going to be an issue and despite putting in French drains over the winter the massive 2012 April rains and subsequent flood has let us know we had plenty more work to do. After that the horrid weather of 2012 we had surprising growing success in our raised beds but our paths were a boggy nightmare. So it was time for more French drains. But despite the bog each Wednesday 15 or so volunteers came along every week and got on with the task of transforming the site to a beautiful and productive garden. We welcomed all sorts of local community groups and all our volunteers are a diverse bunch from all sorts of back grounds and with all sorts of reasons to come to the garden. 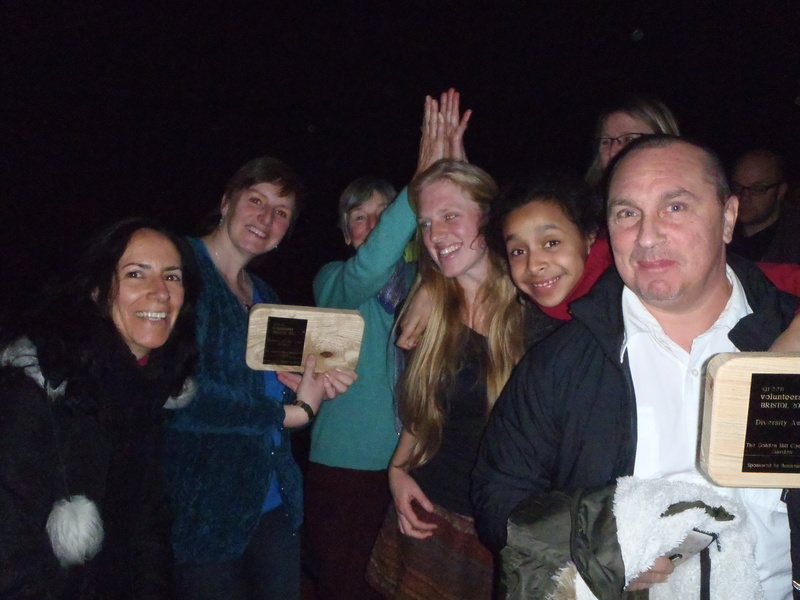 In December 2012 our achievements were recognised in the 2012 Bristol Green Volunteers Awards when we carried away Project of the Year and the Diversity Award. Whoop! 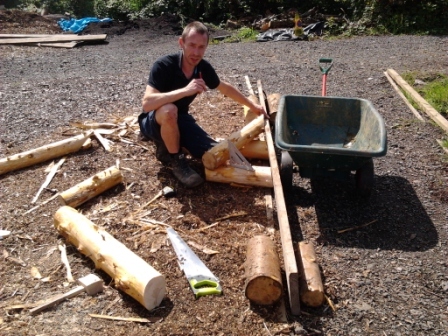 In March 2014 we came to the end of our funded period but undaunted we got busy building the Strawbale Building, launched the Friends of Golden Hill scheme, and the Golden Buds Toddler Group and the Golden Groups. In summer we had up to 40 people coming each week to volunteer on Wednesdays and 20 or so even in freezing cold winter!